I finally got a chance to dive into Sarah Waters' work and I am content. I have made a special note that the fall season really is the best time to experience her work, so I'm looking forward to Carl's RIP Challenge this year even more so. BookLust reviewed the audiobook and as I was coming off audios which really weren't up my alley, I went ahead and downloaded The Little Stranger. This Gothic tale had the right amount of spooky atmosphere, psychological thriller, and bump-in-the-night ghost story tale to wonderfully keep me a bit on edge when I'd listen to it in the car on a cold and dark night. Dr. Farady has a long history with Hundreds Hall, a rambling and sprawling English manor that has seen better days. When once his mother used to work there in the prime of pre-World War II life, the post-war era certainly has a crumbling result, both to the home and to the family. With only two servants now supporting the house, and the Ayers family living an eccentric life, Dr. Faraday's relationship begins. It's a slow and quiet build-up of eerie tension and with Dr. Faraday building an uncomfortable attachment to the house and family, there is the sense that perhaps he is an unreliable narrator. Although he delivers the events as they happen to him and the family, part of me questioned whether or not I should believe him. Needless to say, that contributed to the success of the disturbing tale. Simon Vance was a phenomenal narrator, and you may recall that while I didn't like the story of Dr. No, I finished the audio only because of Simon Vance. Fans of Asylum by Patrick McGrath will be pleased with this story. 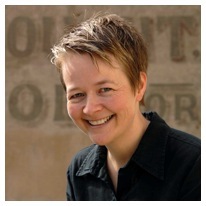 Sarah Waters, a Welsh novelist, is the author of five novels: Tipping the Velvet, Affinity, Fingersmith, The Night Watch, and The Little Stranger. All of them have either already been adapted for television, or the film rights have been optioned. I still can't believe I haven't read this. My only excuse is that I adored Fingersmith and Affinity, so I want to draw out my reading of Waters as much as possible. Glad this was a win for you, and I totally agree about Simon Vance. I love his reading of the Bond books. I read this in print form but still missed the WOW at the end. I had to have another blogger explain it to me. LOL. I can only imagine this made a fantastic audiobook. There was something about it in print that didn't work for me, although I did really enjoy the story. I guess I felt it wasn't spooky enough? You can't go wrong with Simon Vance! I thought the audiobook was excellent too. The beginning was a little slow but Simon Vance was so good I kept going and was glad I did. This was my very first Sarah Waters (on audio as well!) and it certainly inspired me to read everything the woman has ever written. As I like to say, at this point I would bear her children (or Tana French's). And that ending! Holy crap. So powerful but subtle. I loved this book! I read it for Carl's RIP challenge last year and couldn't believe that I had waited so long to read any Waters' books. And you are so right - certain books should be read at certain times, which is why I figured this one would be perfect for RIP ;) I'm so glad you enjoyed it! Definitely gave me the creeps at time and I loved it. Great post! I am off to grab this one on audio, even though I have the print version. I love good narrators, and they can make or break a book for me. I have listened to a few from Vance, and I like him. I also really like Waters, and have all her books. Have you read Fingersmith yet? That one is totally phenomenal! Loved your review today. You said it all without giving a thing away. I got the same feel for this reading it but I'm sure Vance really added to the enjoyment. Audio doesn't work for me but I have SaraW as a must read for the amazing gothic feel. Karl's RIP sounds like a great time to try it. Oh! This one has been sitting on my shelf for so long! I'm glad to hear you enjoyed it, I definitely need to finally get to it. I'm not a Waters fan (worst lesbian ever) but my wife likes her -- I'll get this for her. She walks rather than takes the subway, too, so audiobooks work better for her. I really, really loved this book. Never thought of listening to the audio, but reading your review of it, I bet it would be so much fun to listen to it in the Fall by the fireplace! I really, really loved this book. I never thought to listen to the audio, but after reading your review, I think it would be a lot of fun to listen to it in the Fall, by the fireplace! Never read Waters. I really should. I'm getting a bit set in my reading habits, now. Enjoyed your review. I haven't read this one but I agree that Simon Vance is an excellent narrator! The fact that he has name recognition says a lot.